Photovoltaic or solar cells (PV for short) are made of silicon and can turn sunlight directly into DC electricity. Each cell produces a small amount of current. By connecting many cells together and placing them on larger panels, the electric current produced can be significant. This can be used directly in a DC appliance, stored in batteries, or converted to AC to operate AC appliances using an inverter. 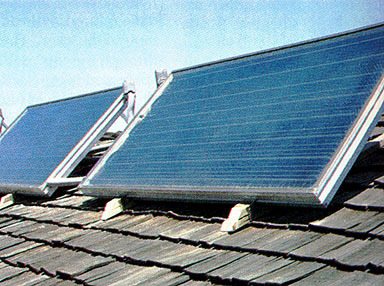 While extremely simple, photovoltaic cells are expensive compared to other generating sources. While the cells themselves are fairly reliable, the sun's rays are not a very predictable resource in most areas. Therefore, other equipment such as battery storage systems and an inverter to convert the DC current AC are often needed. Solar or PV power has consequently mostly been used for specialized situations such as satellites, portable electronic equipment such as calculators, and power in remote locations. 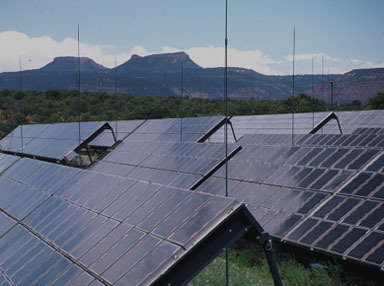 Less than 1 percent of the nation's electricity is produced using PV cells.